While researching Mexican food for Traveler’s “Mexico: 50 Discoveries” supplement, IT blogger Kristen Gunderson not only developed massive enchilada cravings, but she also became smitten with the Mexican Home Cooking school, a place that allows vacationers a true taste of authentic Mexico. Visitors – of any culinary skill level – can spend a week in the home of a Mexican chef and learn to prepare local delicacies while exploring the Puebla region’s most outstanding natural features. The school’s owner, Chef Estela Silva, has been a kitchen employee from the age of 7 and was even featured in the New York Times for her gastronomic know-how. Recently she paused from her busy cooking schedule for a Q&A with Kristen about Mexican cuisine and what’s it’s like to stay at her school. Does your cooking school offer opportunities for visitors to explore the region outside of the kitchen? Take me through a typical day. 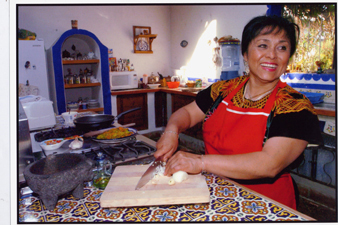 The school is open to anyone of any skill level who has an interest in learning to cook traditional Mexican food. Each class we prepare between five and seven recipes in my home kitchen, which will become lunch and dinner. Lunch includes soup, or maybe a salad, and a main dish, such as beef in pasilla sauce and some type of rice. Dinner could be pipian rojo with pork or rabbit in adobo sauce, and a dessert of gasnates (cream-filled pastry tubes topped with chocolate and powdered sugar – no, that is not hard to make). All this is of course complemented with stories, music, a glass of wine or beer, and no extra charge for the fun that we have doing it all. Lunch is served on the terrace with soft drinks or wine, beer or margaritas. Afterwards it is siesta time. Students can catch up on reading or go off for an afternoon trip. We have cabs that work with us to visit ruins or the city of Puebla, and students can hike on an extinct pine-covered volcano, see hot springs or visit ex-haciendas that are usually closed to the public. On the last night, there is a small graduation fiesta with live music before dinner. Students then get a bound copy of the recipes of the week as a memento and cookbook. What inspired you to create the cooking school? My school has been open about 12 years. I opened it to pass on the many traditional recipes from the city of Puebla that are being lost as time goes by. Ironically, I have ended up passing them on more to non-Mexicans than Mexicans. But that is all right with me as long as they are not lost. The most rewarding part for me is to see people come from all over the world and discover that Mexican cuisine is much, much more extensive then they dreamed and as sophisticated or more so than others. And the plus is that they find how easy it is to prepare and have fun cooking here in the process.